Preview: Head coach Norm Chow has seemed like a poor fit in Hawaii since he arrived three years ago and it’s been a rough stretch for the program going just 8-29 under their embattled head man. This could be the make or break year for Chow and he’ll hope to turn things around with 13 returning starters, but Hawaii has a tough schedule ahead of themselves. There has been a lot of instability on offense over recent seasons for Hawaii, but I like the hire of OC Don Bailey who’ll implement an up-tempo offense after having success at Idaho State. Hawaii has some adequate options at QB with returning starter Woosley battling for the job with USC transfer Wittek and former CSU commit Reilly. Whoever wins the starting QB job will work behind a veteran O-line. The backfield should be set with RB Lakalaka coming back and he’ll be backed up by speedsters Joas and Saint Juste. WR is also set as long as Haynes and Stubblefield successfully come back from injury. Hawaii losses a lot of starters along their front seven and that makes things a bit tougher for new DC Tom Mason. Hawaii’s defense is going to get tested early and often as they go against some of the more physical teams in the nation out of conference. It will be a work in progress along the line and injury prevention should be on Hawaii’s mind with road games early in the season against Ohio State and Wisconsin. The LB position will be led by Poti, Williams, and Fonua. The secondary is a strength with a ton of talent and depth especially at the safety position. Prediction: Hawaii and head coach Norm Chow need a winning season in the worst way and luckily for Chow this is his most talented group since he arrived on the Islands. Hawaii has a brutal nonconference schedule, but if they can get through with relative health then this could be a potential surprise team in the MWC. 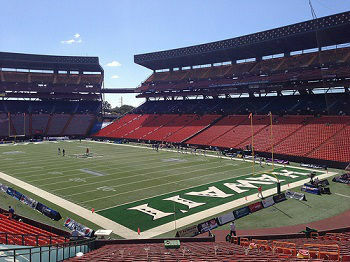 Issues will arise for the Rainbow Warriors if they have to deal with injuries because they lack solid depth. Norm Chow needs a bowl game or he’s likely out the door as the head coach for next season.